From the comprehensive “A History of Cambodia” to his dissection of the Khmer Rouge’s main torture center in “Voices from S-21,” Chandler has charted more of the country’s turbulent and often bloody past than any other scholar. Why is the Khmer Rouge Tribunal important for Cambodia? [There are] maybe three reasons. One is that there is an enormous amount of documentary materials about the Khmer Rouge period, which would not have been available to ordinary scholars. It’s got material that wasn’t available at [the Documentation Center of Cambodia]. It’s got oral material that has expanded the whole documentary evidence about the Khmer Rouge. Reason Two is: I didn’t think that the surviving leaders of the Khmer Rouge should be allowed to die in peace without any kind of justice being done to them. And these are the people who went on trial at the tribunal. They couldn’t have escaped immunity for what they were alleged to have done, and certainly did do. The third reason: I think when the trial was going on—maybe it’s dying down now—but certainly when I was there last in 2012, there was quite a lot of interest among the Cambodians. They would show up every day. Several hundred people would be trucked in, to increase of the whole educational knowledge of the Khmer Rouge period. People had experiences of what they had had themselves, but then they didn’t have any idea of what was happening nationally. 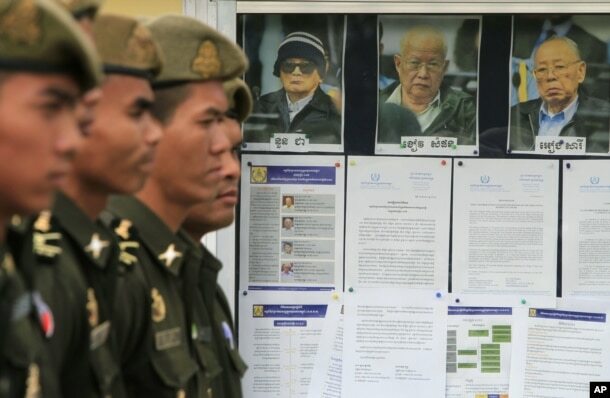 Cambodian military officials line up in front the top leaders of Khmer Rouge portraits, from right, former Khmer Rouge Foreign Minister Ieng Sary, former Khmer Rouge head of state Khieu Samphan, and former Deputy Secretary Nuon Chea, during the second day of trial of the U.N.-backed war crimes tribunal in Phnom Penh, Cambodia, Tuesday, Dec. 6, 2011. The leadership of Cambodia doesn’t seem interested in doing anymore—they weren’t interested in the tribunal in the first place. Hun Sen never wanted it. An indication of how much he didn’t want it was he made sure that Duch’s defense lawyer was his own personal lawyer. This is how he was handling the outcomes as best he could. I think the trial might have been improved had they, in the last year or the year before, been able to pursue some of the second-level people they wanted to go after. But this is where Hun Sen put his foot down and said, “No more trials” because, for one thing, the next bunch down were in touch with a lot of the people, like Chea Sim, the top surviving ones who got off…. [Hun Sen] didn’t want the possibility of light shining on those other people. But that would have been interesting, but it didn’t happen, so I think what we got is OK.
After the fall of the Khmer Rouge, how optimistic were you about Cambodia’s transition? And how did Cambodia get from there to where it is now? When the Khmer Rouge fell, I was actually quite happy. A foreign occupation is not always a good idea. But I think the Vietnamese—who are not given much credit at all by any Cambodians for this—stopped the Khmer Rouge. They fought the Khmer Rouge and they kept the Khmer Rouge from coming back. They fought them on the Thai border. They lost several thousand people. I mean I’m not pro-Vietnamese, but this is extraordinary. The Cambodians didn’t lose any people fighting another country. It’s not their style. "I am not optimistic about the Cambodian political leadership, and I am not optimistic about electoral politics running against them. I don’t think it’s going to happen." Now of course in that 10 years when the Vietnamese were there, human rights was not very well taken care of, political opposition was nonexistent, isolation from the world was quite harmful to [Cambodia’s] economy, there are all sorts of things you can criticize… But the main thing they did was they kept the Khmer Rouge from coming back into power, militarily, by resisting them. Then you had the U.N. and the Paris Peace Accords. The U.N. operation had its flaws, but its big success was bringing 300,000 Cambodians who had been living in refugee camps back into Cambodia. Instituting human rights organizations, Sihanouk did this. They are [still] not in Vietnam and they are not in Laos. I’m thinking of Amnesty International and Human Rights Watch—they are not allowed in those countries. Opening up the country for foreign investment is very important, the U.N. period did that. Now there were inefficiencies again. The U.N. was constantly criticized. I was there for a bit of the time, and people were making far too much money for doing far too little work in many ways. They also didn’t take any hold on the government. Hun Sen was basically still behind the scenes, governing the country with his CPP. 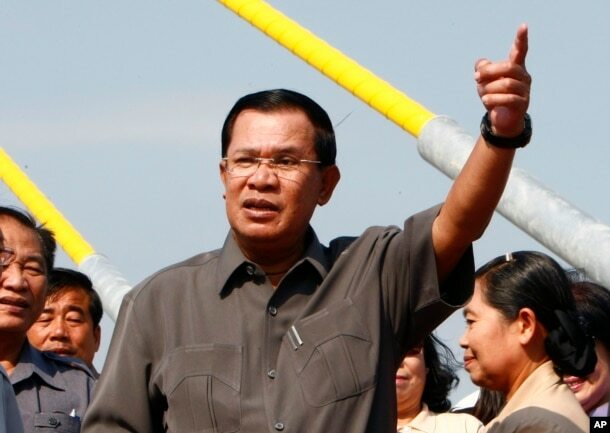 1997 was very unstable, but then [Hun Sen] got a grip on things, and things got calmed down. The investment came in, the factories grew up, and the education started to roll along better. People living overseas started to come back. And then there were a bunch of elections that didn’t mean much, until the 2013 election. I didn’t think that Sam Rainsy was really a credible opposition leader, if we’re talking politically, he’s too inexperienced and tied in with a lot of foreigners. He kept coming to America and being treated like sort of a king in exile by the Republicans. "But I think a lot of people at your age are kind of optimistic. People your age are quite educated and alert, but, I think, worried about where it’s going." ​He’s an intelligent guy. He is physically brave in a way—he faced up to that bomb attack and so on—but he wasn’t going to be an effective leader. Hun Sen has been able to take charge: arrest him, release him, arrest him—play games with him, in other words. He does that and [Rainsy’s] people don’t have any guns. I’m never going to say on your program or anywhere else that Hun Sen should be overthrown by force, but he is not going to be overthrown any other way. 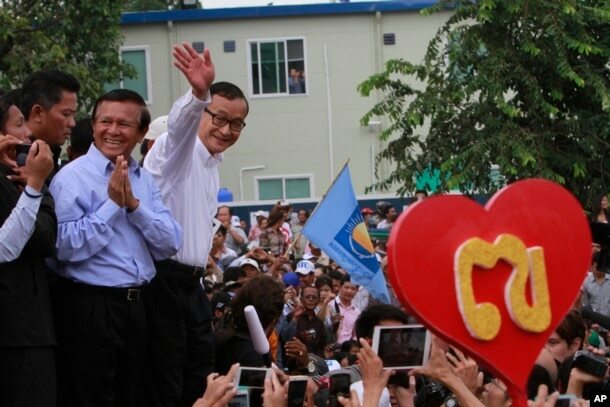 Opposition Cambodia National Rescue Party (CNRP) leader Sam Rainsy, right, accompanied by his party's Vice President Kem Sokha, second from right, waves to his party supporters during a public forum of the July 28 election result, in Phnom Penh, Cambodia, Monday, Aug. 26, 2013. I think they had probably won five or six more seats, but we don’t know which ones. But the government […] because they didn’t want [CNRP] to get close to a majority, where they could cause a lot of trouble in the National Assembly. But Hun Sen had to make sure that the National Assembly does not have any power. I am not optimistic about the Cambodian political leadership, and I am not optimistic about electoral politics running against them. I don’t think it’s going to happen. I am not optimistic about Hun Sen’s changing his ways of governing or changing the “king for life” [role] that he thinks he is. He is not going to change. But then you have to be optimistic about developments that are happening all over the place, like universities that teach serious courses. You don’t buy your diploma. Schools are better, I mean some of the private schools, people are getting a good education. People go overseas for training and come back. There’s a pool of [qualified] people. Civil service salaries are getting almost—they’re [still] not livable, but they’re much better. It was $60 a month for many years—[that was] hopeless. How can you not be corrupt for $60 dollars a month? you can’t live for a week in Phnom Penh for $60 really with a family. That was for a month, toward a house and everything else. So that’s all changed, a bit. Those are optimistic, some of those developments. But I don’t like the Chinese dams on the Mekong, that’s another bad development for the future. I don’t like the whole position of China as a kind of overseer over the government, I don’t think it’s very healthy. I don’t think Hun Sen and people have thought through what that means. When the Chinese ever want to put a little muscle to it, the Cambodians won’t have any resistance to it. I don’t want there to be a client state of China, but they might get to that position. That’s grounds for pessimism. "I am not optimistic. If being optimistic means political change that would produce a more liberal government where the National Assembly has the power as it is supposed to have under the Constitution—I don’t see that happening as long as [Hun Sen’s] alive." But I think a lot of people at your age are kind of optimistic. People your age are quite educated and alert, but, I think, worried about where it’s going. Maybe people are not optimistic politically, but they are trying to do different things. And they are not in the way of Hun Sen, they are not taking active political roles against him, so they are not in danger of going to jail or getting shot. So what happens after a dictator dies? What do you see for the future after observing Cambodia for so long? That will certainly be a cause of change. They say [Hun Sen] is selecting his son to succeed. One of the models was Singapore, the Lee Kuan Yew model. How smoothly that would happen? I don’t know. I mean his son would have to start making deals and arrangements now, to make sure that he is friends with people who are floating Hun Sen. That’s the Oknha, the various big business people, tycoons of various kinds, big interests, make sure that: When my father dies and I come in that you guys won’t object to this because your financial arrangements will not be bothered. They keep saying there are rivals in the CPP, but I don’t know. I don’t think they are. I don’t think anybody who is allowed to come up with any kind of vigor. I think that the CPP is quite happy to have the kind of income that they all have, the kind of lives they all have. ​So if he dies, it’s a start. Once those Oknha arrangements are in place, then the question will be whether the son would be interested in reforming the country at all. [That would mean] setting up a viable tax system, which is not really political, getting rid of a lot of people from the army—you don’t need an army 100,000 people, they are not fighting anybody. There are lots of things that can be done if he wants to reform. But the first thing he’d do—and he’s probably doing it now—is not making the sort of noises that suggest to these powerful people that he is going to be a problem when he comes in, because they want to stay. They’re rather like the very rich people that support the [U.S.] Republican party and are very distressed by Trump right now because they might not be able to get their money. I never would have said that before, but really it’s true now. 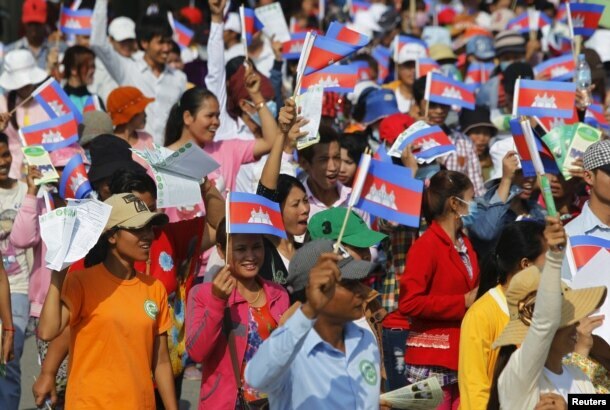 Cambodia Garment workers shout and wave Cambodian national flags as they take part in a protest calling on the government to raise wages during a march to mark Labour Day in Phnom Penh May 1, 2015. I am not optimistic. If being optimistic means political change that would produce a more liberal government where the National Assembly has the power as it is supposed to have under the Constitution—I don’t see that happening as long as [Hun Sen’s] alive. I don’t see where a successor could come from who couldn’t manage that support system because the support system would just smother them. They would just kill them. They might do that. Just a car accident—that’s enough of that guy, coming in and trying to reform everything. I’m sure those arrangements are all in place. And China, it can’t be unhappy. Since you mention foreign backing, is Cambodia important at all in geopolitics these days? No. Cambodians have always thought their country is more important than it is. They have every right to do that, but they just have to look and see how many people they’ve got, where they stand, what natural resources they have and so on. They’re just not a power to be reckoned with. I think the international community was stung in the Vietnam War and other places where they just did too much intervention. The Khmer Rouge period, the allies and the Lon Nol period, and the French before that, so they are not coming back into Cambodia to rescue anything, to save anything, they’re not going to do that. What do you think young Cambodians can learn from History? Cambodians don’t think history is very important. They think other things are more important than history, which there are. But I don’t think it is wise not to know where you’ve been, because you can exaggerate where you are going, and you think you make more difference in the world than you do. Or you can think that foreigners are always going to build you a house, which they’re not. Or you can think that the Khmer Rouge were not a Cambodian phenomenon, which they were. It’s painful thought, but they were. They were not foreigners. I’ve had people ask me if Pol Pol was Vietnamese. No, he was very Khmer. But they have to be aware of that. "Don’t get involve with confrontational politics, because that’s the kind of politics Hun Sen understands perfectly. He’s got the power. You guys don’t. It’s as simple as that." You have to be thoughtful to see what you could do when things go wrong and what you could do when things go right, and what your resources are. I think young people are the resource right now, so let’s see how they cooperate. That’s not a big Cambodian word. 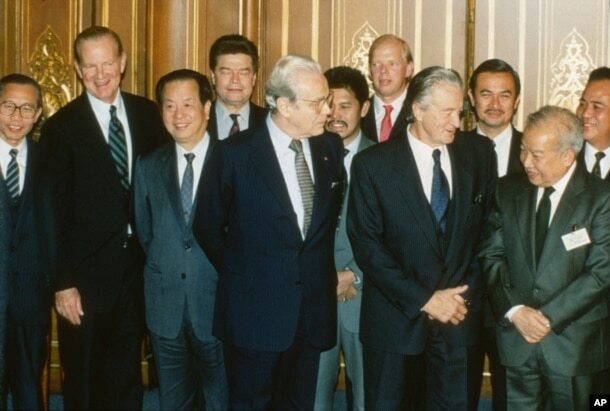 When they had Paris Peace Accords, when they were putting up the Cambodian text of the Accord, they couldn’t find the Cambodian word for consensus, because there is no Cambodian word for consensus. They just kind of agree or disagree or they fight all the time. You’ve got to remember that, if you want to get anywhere you’ve got to cooperate with people. Or you just use violence, that’s the other way to get ahead. Just use violence, get people scared, and that’s what Hun Sen has done. But I think he’s scary. I think people realize it now as all over the world that the big topic is inequity [between] the big rich guys and the little guys. If people start realizing it’s not just American problem, it’s very much a Chinese problem, a Cambodian problem [as well]. But I’d like to see people realizing that that kind of situation can get incendiary. A fire can start eventually, if you get too much of that. If the workers really start getting angry—well, you wouldn’t get the country changed, but you’d get a lot of workers killed if they got themselves really organizing and demonstrating more and more and more. What would you ask Cambodia’s younger generation to be cautious about? Confrontational politics. Don’t get involve with confrontational politics, because that’s the kind of politics Hun Sen understands perfectly. He’s got the power. You guys don’t. It’s as simple as that. Unless you’re somebody like Mu Sochua—she’s got American husband and I think that saves her in a way. She’s very brave, she’s courageous, but most people don’t have that kind of backing. You know, putting her in jail with her American husband is just not a good thing to do, and she’s brave. But I don’t think people are going to be brave by themselves. 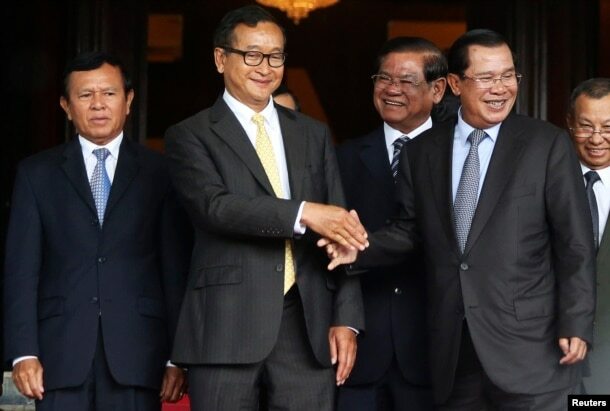 Cambodia's Prime Minister Hun Sen (2nd R) shakes hands with Sam Rainsy (2nd L), president of the Cambodia National Rescue Party (CNRP), after a meeting at the Senate in central Phnom Penh July 22, 2014. Cambodians don’t get organized themselves very well, and it is hard to. So I think confrontational politics is a thing to avoid until, as I said before, maybe until Hun Sen dies and somebody else comes in. [Then] you could start dialogue. He started this dialogue a few years ago but he just didn’t believe in it. It’s not his style. Monologue is his style. And it was Sihanouk’s style, and Jayavarman VII’s style. Those guys don’t do dialogue. [editor’s note: Mr. Scott Leiper, Mu Sochua’s husband, passed away in March in New York after battling pancreatic cancer. 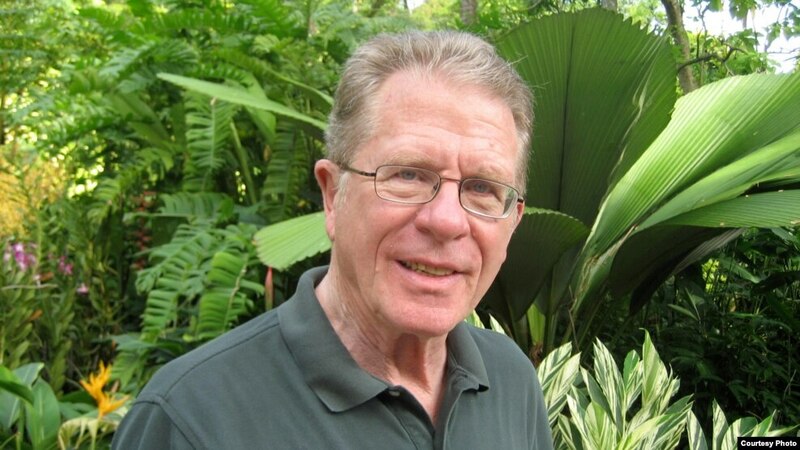 He was an international aid worker in Cambodia over three decades].